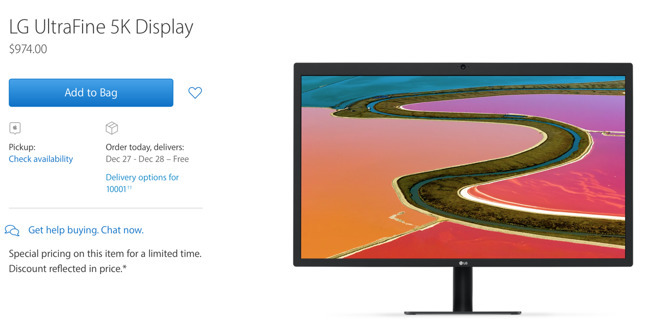 Apple on Tuesday began accepting orders for LG's 27-inch UltraFine 5K Display, featuring Thunderbolt 3 USB-C connectivity designed for the new lineup of MacBook Pros. The first orders of the LG UltraFine 5K Display are scheduled to deliver on Dec. 27 or 28, just missing the Christmas holiday. Units are set to begin arriving in stores a day later, on Dec. 29. The launch of the UltraFine 5K Display comes just before the end of the year, when prices on USB-C accessories originally slated to increase. Apple instituted a temporary 25 percent discount on USB-C devies, but users could not order the LG UltraFine 5K Display until Tuesday. While the 5K monitor is currently $974, the price was scheduled to return to its MSRP of $1299.95 as of Dec. 31. Given the limited timeframe to buy, Apple has extended the deadline, and the $974 price will remain until the end of March. Accordingly, Apple has extended the discounted deadline to all other USB-C accessories as well. Last week, AppleInsider reviewed the LG 21.5-inch 4K display, which uses USB-C —but not Thunderbolt 3— to connect to Apple's recent MacBooks. The lack of Thunderbolt 3 support allows the smaller monitor to work with the 12-inch MacBook, but it also means that USB-C inputs on the back of the display are limited to slower USB 2.0 speeds. Those concessions do not exist with the 27-inch model, which uses the Thunderbolt 3 protocol over USB-C connector. That allows 5K video, stereo speakers, a camera, three USB-C ports at USB 3.1 speeds, and up to 85 watts of charging power over a single cable. However, the 27-inch LG UltraFine 5K Display requires Apple's latest MacBook Pros with Thunderbolt 3 support, leaving out users of the 12-inch MacBook. LG's high-end display boasts a 5,120-by-2,880-pixel resolution and P3 wide color gamut. In all, it has more than 14.7 million pixels.